Italians don’t do ham for Easter, they do lamb. Unless, you’re my grandfather, who, although is about as much Italian American as they come, for some reason loves ham. Growing up, Easter Sunday was an egg hunt between my brother and I in the morning (which I always won) followed by copious amounts of Italian Easter bread (no better baked good in all the world) for breakfast and a lamb roast in the late afternoon for dinner. I’ll never forget the one year, somewhere in the middle school years, when my mom and I drove down to little Italy in the Bronx for an excuse to get some fresh mozzarella, cannolis and the best ravioli you can get outside of making it yourself. We parked the car, put money in the meter and I turned around to see an entire lamb carcass staring at me from the window of one of the hundreds of guido deli-like joints little Italy is filled with. It was basically the entire animal, sans skin & fur, hanging by it’s legs just dangling in the window. I suggested we do ham the next Easter after that. It took a few years, but I got over the lamb incident and decided I was cool with eating it again. Funny enough, my mom has since swore off baby animals and we’ve moved more towards Easter brunch rather than dinner in recent years. So since I won’t be eating it next weekend, I decided to take all the typical flavors of a lamb roast and create a pasta dish reminiscent of the good ‘ol days when my young naive mind only associated bread, chocolate and egg hunts for Easter, not hanging lamb carcasses. 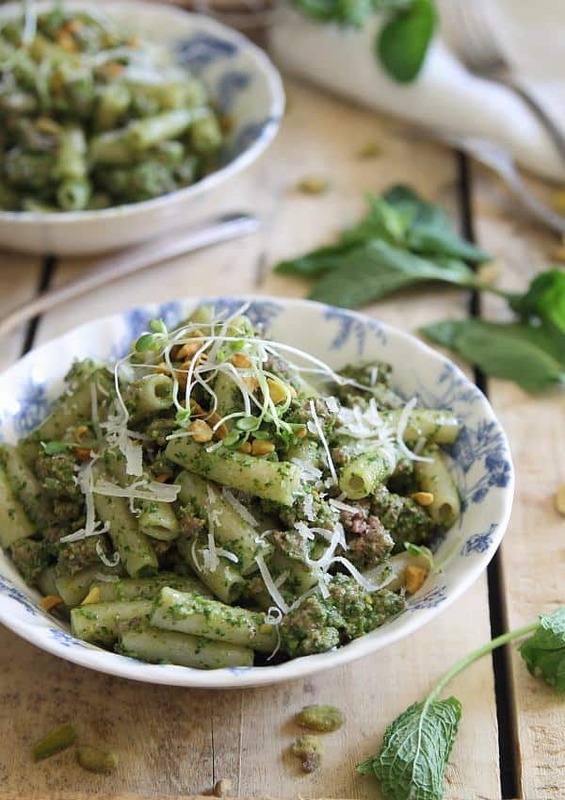 The pesto is filled with mint, sprouts and pistachios and pairs perfectly with the ground lamb. This was my first time trying brown rice pasta and while you can certainly use any pasta you want, it’s chewy texture is kind of fun and since I’m on a quest to keep excessive wheat out of my diet, it worked. If you want a hearty dish to celebrate spring, this is your meal. Once boiling, add pasta and cook according to package directions until al dente. Add the cooked lamb and the pesto and toss to combine until the pasta is fully coated with the pesto. Serve with additional pistachios, grated parmesan and sprouts for garnish. Combine all ingredients except olive oil in a food processor. With the food processor running, drizzle in the olive oil. Process until smooth, scraping down the sides as needed. I ADORE lamb (except not when it’s hanging from a window)…and pesto. But I’ve never had mint pesto….that must change. 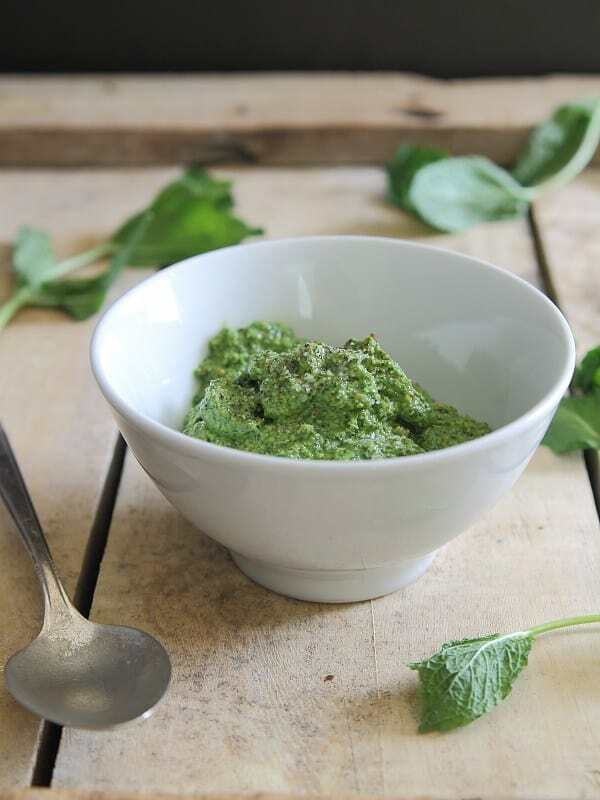 Love the mint pesto, sounds amazing! Beautiful presentation. Beautiful!!! I think its a great dish. I didn’t grow up celebrating Easter beyond going to church (we have week long church events, though), but now I normally have lamb as well with my orthodox BF, friends, and family. I’ll say in advance I will NOT BE ALLOWED to make anything for Easter because they are peculiar in what they want to eat. Still, like Daisy Martinez would say, your dish is “easy enough for a weeknight, but fancy enough to have it with company”! 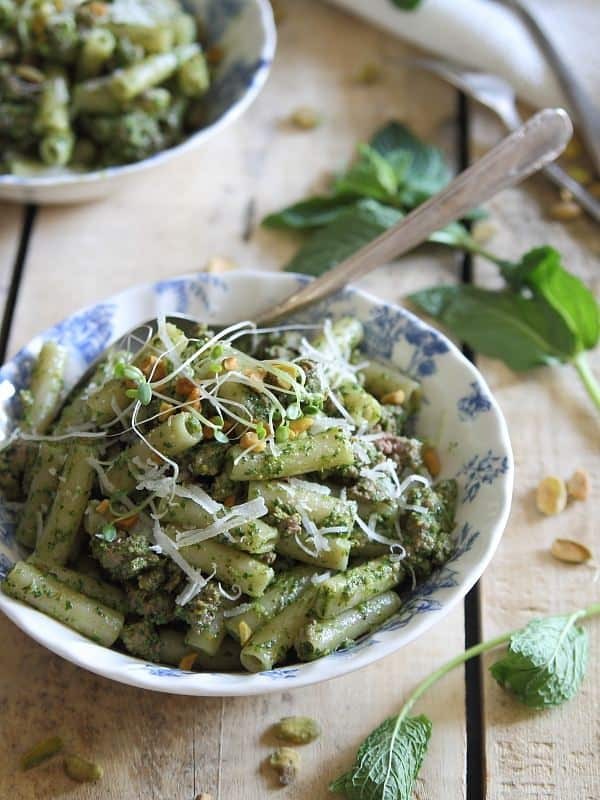 Ooh, I love the idea of mixing up the traditional lamb & mint sauce in pesto pasta form! Super fresh and exciting.